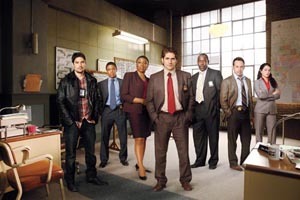 A prime-time cop drama premiering Sept. 21 (ABC, 10 p.m.), is already receiving backlash from critics who say the production perpetuates the perception of Detroit as dangerous — not to mention 187 is California’s police code for homicide. Though the pilot episode was shot in Atlanta, production for the remainder of the show takes place in Motown — a first for a network series. (On cable, HBO’s Hung is set in Detroit, but filmed in L.A. with cameo appearances by Detroit landmarks). Even if Detroit plays the villain in the ABC series, it’s about time the city was cast in a starring role. Review: Detroit 1-8-7 is like a coney dog with ketchup. Detroit 1-8-7 actors offer their take on the city during red carpet premiere. Executive Producer David Zabel on the controversy surrounding Detroit 1-8-7. Detroit 1-8-7 star Michael Imperioli talks with Hour Detroit about his music career. Party pictures from the Detroit 1-8-7 red carpet premiere at MGM Grand Detroit.